Plenty of stories recently about the massive uptick in ebook sales (though many of them are playing a little fast and loose with the figures), but with an uptick of interest in an infinitely reproducible good comes a proportional uptick in people interested in getting it for free. eBookNewser points to an Attributor study that seems to suggest the arrival of the jeebusPad – which has made some publishers very excited, perhaps by dint of being arguably the first piece of ereader-functional hardware with a bit of sexiness to it – has brought with it a 20% increase in search queries for pirated versions of ebooks. Attributor began the project by investigating the relative importance of the cyberlocker sites (sites that store personal digital files) in the book space, including Rapidshare, Hotfile and Megaupload. Google Trends allowed Attributor to extract data and compare the relative importance of terms searched for pirated content. The study showed that the popularity of Rapidshare as a host for pirated content has steadily declined since Attributor first raised awareness about the site in August 2009. However, other, smaller cyberlockers, have increased their position in the piracy market, with a 54 percent increase in overall demand for pirated material since August 2009. Further, recent innovations and availability of new technologies has catalyzed e-book syndication opportunities. 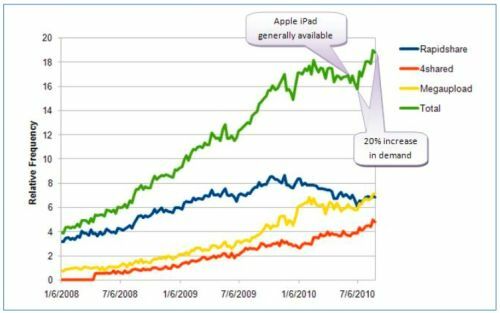 The chart below shows a spike in the demand for pirated e-books around May 2010, only one month after the release of the Apple iPad. More than 250 iPhone, iPad and iPod platform users searched for pirated copies throughout the study, pointing to the immediate need to raise awareness and education about syndication proliferation in the age of digital and mobile media. Now, I’m no stats boffin, but it looks to me that the green curve there is actually just continuing much as it was before the iPad’s arrival; the downtick around its launch date could be down to any number of factors, but I remain to be convinced (or have more thoroughly explained to me, perhaps) how the increase since then is out of character with the curve as it was before. A generous helping of cynicism salt is required to season Attributor’s interpretations, of course, because they’re in the business of selling ‘solutions’ to the piracy problem (good luck with finding one that can’t be circumvented by a handful of bored teenagers with a crate of Mountain Dew, folks); their implicit demonisation of “content lockers” will be a familiar meme to those who follow the digital end of UK politics, also (content lockers enable piracy, therefore they should be banned or policed; no suggestion of banning cars for enabling people to be knocked over yet, though). What’s fairly obvious and believable, though, is that demand for pirated ebooks is climbing steadily, and has been doing so consistently. And that spells trouble for anyone looking to make ebooks a part of their business model… indeed, I wouldn’t be surprised to see similar growth curves for interest in pirated music files from around the time when the first affordable mp3 players began to appear. The publishing industry appears to have woken up and smelled the coffee much more quickly than the record labels did, but whether they can successfully cut the Gordian knot of abundance economics remains to be seen… and while it’ll doubtless mark me as a Doctorow 5th-columnist*, I feel pretty safe in saying that DRM and closed hardware isn’t the sword for the job. The eBook future looks pretty bright for consumers, with devices improving and dropping in price, and a wealth of material to read thereon. But writers are worried, with some justification – after all, if the Kindle does for publishing what the iPod has done for the record labels, no one’s going to get much money for writing short stories any more. In general, the biggest argument against DRM seems to be that it provides positive things for the seller but only negative things to the buyer. Here’s a DRM proposal that actually helps the buyer, while taking away some of the biggest nuisances. I’m sure I’m not the first one to come up with it. It’s account-based DRM. What I mean by “account-based” is that when a person buys a book, that person gets a permanent license to read that book on any eReader device they own, from a smart phone to a dedicated eReader to, who knows, their wide-screen TV with a little black box attachment. Computers might or might not be included; that would be mainly a technical issue. This “account-based” idea is different from what’s usually talked about when people talk about eReader DRM, which is “device-based.” That is, much of the thinking about DRM has been that when I buy a book, I get to read it on the particular device I bought it for and nowhere else. It’s a well-thought out set of ideas, and Reid has worked hard at including the flaws and objections. Unfortunately, I suspect it’s predicated on too many ‘ifs’ for it to be viable. An industry-wide standard retail structure complete with hardware and software that supports the system may sound easy on paper, but the real world is a little more messy, and getting competing companies to work together is like herding cats. That said, Reid’s piece is one of the most honest defences of DRM I’ve ever read; maybe the publishing houses should get a think-tank of smart writers and readers together to boil up new ideas instead of leaving it to the beancounters and engineers? Well, bravo to them for making the effort. I give it a maximum of two weeks of the system being out ‘in the wild’ before someone cracks it open like a seasonal hazelnut. Comments Off on Open-source DRM? WTF? Sven Johnson reports on intellectual property wranglings in Second Life for the latest instalment of Future Imperfect. Second Life’s unique content creation tools have been its strongest unique selling point, resulting in a vigorous virtual economy. But there, just as in real life, intellectual property rights are a thorny issue – and there are signs that the social media masses are starting to change their attitude to content theft.